Grande Paws began the summer of 1992. I had just graduated from Castleton State College with my bachelors degree in Fine Arts. My first efforts, outside of finding employment, was to locate an apartment that would accept pets. Once I had the place all I needed was the dog. On May 3Oth of that summer I found her. She was one of 11 yellow pups born in Hubbardton, Vermont. 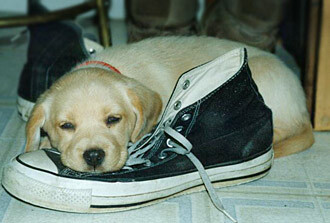 Her mom was a shepherd mix, and although no one knew who dad was, it seemed quite obvious he was a yellow lab. She was the shyest of the lot. I named her Cayenne because of all the time I had spent living in New Orleans. She became my life. She was too tiny to put regular bandanas on, so I made her little scarves all her own out of some of the cottons I had left over from my quilting . That little scarf got as many comments when we were out as she did. So, that summer, I came up with a name for them and took a spot at the Rutland County Farmers Market on Saturdays to try and sell my newly named product: Pawkerchiefs ®. What began as one sided in only 3 sizes, and then expanded to 5 sizes, quickly turned into reversible neck wear with a totally different back side. It is like getting two in one. 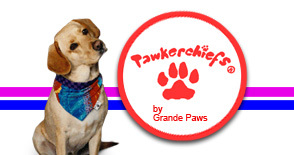 Not much else has changed in Pawkerchiefs ® over the years. I still search out the best in cottons, and each one is still cut and sewn by hand. Life around here in the studio has changed some. We lost Cayenne in May of 1996, from complications after surgery. At the time my only rationalization was that she had left us to make room for another. I assumed it would be another 4 legged friend. That fall I found out I was pregnant! Our son, Noah, was born July 3, 1997 with beautiful yellow hair. By 1998 Noah was on the move. One summer day while gardening in the yard, when I turned and saw that Noah had climbed onto the bulk head to watch the world go by. This was the one spot that Cayenne had always claimed as her own world watching spot. So, life goes on.